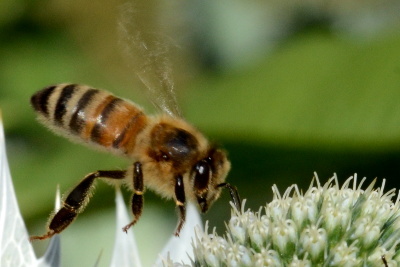 A healthy honey bee, which is collecting nectar from a plant called Miss Willmott´s Ghost. Photo: Karl-Erik Johansson, VetBact, SLU. American foulbrood is a serious disease in bee brood (larvae) and it is caused by the spore forming bacterium Paenibacillus larvae. This disease can be found all over the world, where honey bees are kept in hives and it is spread by worker bees that may carry P. larvae spores in their honey stomach. In a very interesting article by T.S. Brady et al. from 2017, it was shown that phage therapy can be used as an alternative to antibiotics for treatment of honey bee larvae suffering from American foulbrood. The authors used a mixture of phages isolated from three different strains of P. larvae, which was added to the sugar solution used in the feeders. Infected hives were completely recovered within two weeks of treatment with the phage mixture. There are many advantages in using phages instead of antibiotics for treatment of bacterial diseases, which are discussed in the above article. Just fantastic this article. There is hope.